There is no doubt that our head baker Roman Kucharski has won Townsville over with the rainbow of beautiful doughnuts, pastries and desserts that roll out of Otto’s Artisan Bakehaus on the daily. But now, he is steering things into new territory, with the launch of a schmick new range of artisan savouries. Roman has seen his already fascinating range of loaves and sweets and now raised us with a new and wide assortment of piquant pastries and breads, perfect for those looking for lunch or a snack on the go. You can choose from a range of new products in all shapes and sizes; from ham and cheese croissants to cheese sticks, vegetable tarts and fruit loaves… all finely curated by our expert craftsman bakers, using only the best ingredients. Just like Roman’s other products (which, by virtue of being amazingly delicious and popular, fly off the shelves each day), these new savoury offerings aren’t made using any fillers or replacers. Baked the artisan way, in our specialised stone floor ovens, they are earthy and rustic, popping with flavour, freshness and the goodness of fresh, pure ingredients. But of course, taste is paramount, so you will be pleased to know that each and every one of our new savoury treats ‘pop’ in that department too. 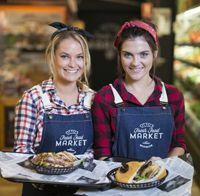 So now that it is safe to say that Roman and his team have perfected much more than just bread and sweets, it’s time for you, the hungry foodies of Townsville to pop in to Otto’s Fresh Food Market while our new savoury range is in abundance. Each morning, our counters are stocked with these savoury creations, but they are already so popular that they simply don’t last long!